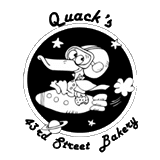 Quack's 43rd St. Bakery is the current incarnation of Captain Quackenbush's Intergalactic Dessert Company and Espresso Cafe which had, at one point, been located on " The Drag" in Austin, Texas. We are a full service espresso cafe and from scratch bakery. We continue to provide late night study aids and that early morning caffeine fix our customers crave and hope to do so for for another 30 years! We offer a wide range of desserts that are all made right here in our Hyde Park location. We continue to expand weekly and are now offering locally made Deli items from Fricano's Deli! Let everyone know to .."Meet me at Quacks". Quack’s line of bakery products grew out of a need to provide freshly baked goods for our customers. All the baked items sold here are made here from scratch. We use high quality, natural ingredients. We do not use frozen dough or mixes. Our bakery products contain no preservatives, high fructose corn syrups or additives. 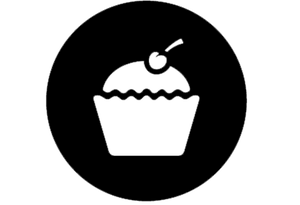 We provide service to many wholesale accounts that elect to serve their customers better quality baked goods in lieu of more commonly available, less expensive commercial products. We invite you to come visit Quack’s. There’s always something new and we’re always evolving!